Proper Running Footstrike: 3 Steps To Improve It! As a lot of you know by now, running boils down to a lot more than just putting one foot in front of the other. 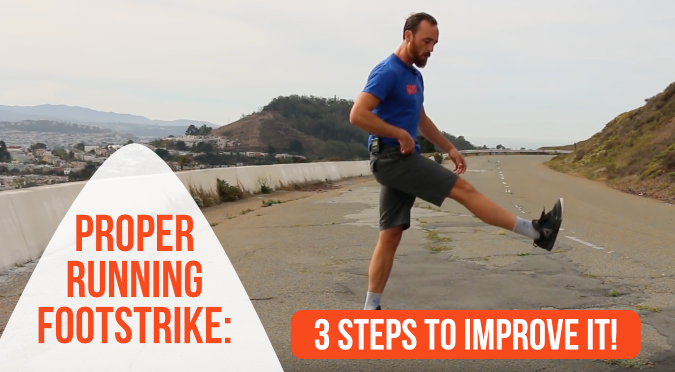 In this post we tackle proper running footstrike with 3 surefire steps to improve it! The way your foot hits the ground as you run tends to fall into one of three categories. Before we get into what they are, let’s first make something very clear. One isn’t better or worse than another. They are each valuable for some type of terrain, elevation change, section of a race, etc. Understanding when to use them, and how to blend them to find your most “neutral” footstrike for the long runs will be our key focus here. In this method, the heel hits the ground before the rest of the foot follows suit to land. 1) If you spend most of your day seated, you’ve probably developed chronically tight hips. 2) Due to this, your stride reaches out much further in front of you than it needs to. 3) You drive your running with your legs and feet, not your hips and glutes. 4) The heel style strike is your best attempt at catching and continuing that stride from one leg to the next. While we don’t encourage “defaulting” to the heel style strike out of poor running form (especially for longer runs), we do think it can be beneficial as a brake system on a downhill or sharp turn. You’ll find this type of footstrike on the opposite end of the spectrum. 1) our weight is heavily focused onto the ball of the foot and the toes. 2) Your heels are likely not hitting the ground between steps. 3) Your upper body may be a little bent forward from the hips. 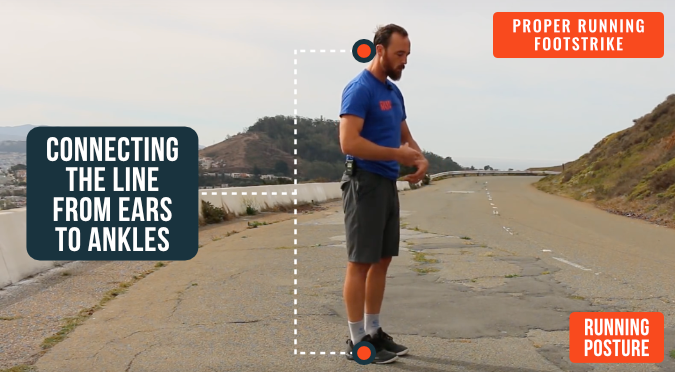 Though spending an entire long run in this position would lead to tightness and cramps in the achilles’ and calves, the forefoot style footstrike works well to kick up your speed across a finish line or up a short hill. Consider it your gas pedal. This is the most neutral footstrike of the three. Most of your foot hits the ground at once, with your weight balanced right about even on top of your hips, knees and ankles. Though you’ll definitely want to utilize your new “brake” and “gas” pedals, you’ll want to find some version of this mid-foot style strike to use on the bulk of your longer runs. Lucky for you, we’ve got 3 tips to help you do just that! Picture this: the foot is at the end of a long kinetic whip. The way it hits the ground is a direct result of what your upper body and hips are doing. The only way it can respond properly is if your upper body posture supports it. This means head stacked on top of shoulders, shoulders on top of hips, etc. 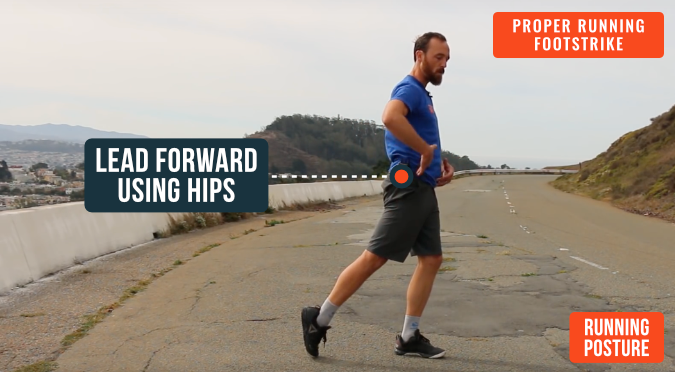 As a result, the hips and glutes will be able to engage and push forward, allowing the stride to open as the leg swings back and cycles forward in one fluid motion. Increasing your hip mobility and strengthening your glutes will help make this possible! For every leg swing, there’s an arm swing. This contralateral movement is what drives your running. Improving the range of motion and power of your arm swing will inform the legs, creating an easier, more sustainable footstrike. Relaxing the shoulders will increase the range of your arm swing and thus drive more power to your legs. *Remember: arms swing front to back, not crossed in front of you! We all know what that “marathon shuffle” looks/feels like. 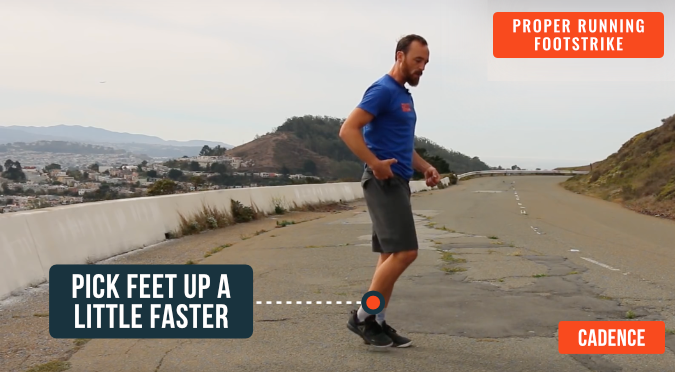 Putting a little pep in your step can spark a whole chain of improvements in your running form and therefore, your footstrike! A stronger hip position allows you to pick the feet up off the ground faster. In turn, that increased cadence encourages the feet to relax and re-strike the ground in a more neutral, shock absorbing manner. If you can make change in these three areas, your feet will start to strike just beneath your hips. Not way out in front of you for your heels to deal with, and not behind you, for your toes and calves to support. Understanding that the footstrike is directly related to the rest of your body’s running habits will make all the difference. Even if your new footstrike is heel or toe dominant, it will likely be more comfortable and sustainable for those long runs. For sticking with us to the end, enjoy 2 FREE WEEKS of our best running, strength and mobility workouts. No equipment necessary! Get it here.